Mattress disposal bags are a clinical waste bag designed to reduce the risk of spreading infection and prevent accidental contact during handling when soiled and potentially infected mattresses are taken for storage, laundering and incineration. Bag fully encloses all standard mattress sizes. Mattress disposal bags are a clinical waste bag designed to reduce the risk of spreading infection and prevent accidental contact during handling when soiled and potentially infected mattresses are taken for storage, laundering and incineration. GV Health mattress disposal bags are made from heavy duty 125 micron polythene and have heat sealed end seams and a low slip surface. Bag fully encloses all standard mattress sizes. Once the mattress is inserted the end can be secured using the supplied cable ties or adhesive tape. 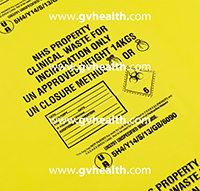 Mattress disposals bags are available in yellow only, are printed with UN approved markings required for clinical waste bags of this type and include a write on panel for adding tracing information etc. Approved for use by CQC, NHS, DoH. Key Features: Made from heavy duty 125 micron polythene Heat sealed end seams Low-slip surface Suitable for incineration Large size accommodates all standard hospital / clinic mattress sizes Cable ties supplied to seal open end.